John tells us that in the final state there will be no sickness or disease. Most Christians tend to think of our glorified body as a perfected body. And yet, Jesus’ resurrected body was not perfect. The wounds from His crucifixion remained. What does this tell us about our own resurrected body? Could we retain our wounds too? If you lost a finger in shop class, do you only have nine fingers forever? Or do you think Jesus is just a special case. Perhaps He kept His wounds for evidential purposes, to convince the disciples that the Jesus they were seeing was the same Jesus who had been crucified? Jesus’ appearance with wounds was probably a unique situation, or as you say, for evidential purposes. I don’t think limbless people would be limbless in their glorified bodies – also what about cremated people? IMO, the reason for Jesus still having the remnants of the wounds he suffered during the scourging and crucifixion in all its simplicity was because Jesus survived the crucifixion. The wounds had healed but like all severe wounds in the healing process, they scar, which is why Thomas was able to place his fingers in the indentations of the nail punctures and the sword cut in his side. In addition to the wounds Jesus was also quite human as well when he was seen by the disciples after the crucifixion telling his disciples to handle him and eating food in front of them. Info is limited, but IMO our glorified bodies will be the best we can be using our “DNA” as it were as a base line. That is physical and mental disabilities will be repaired. I also believe gender will not be done away with but we will not marry or be given in marriage. I agree, Jesus is a special case and His wounds will remain, they will be healed in some fashion but remain. This is not just for evidential purposes but as a commemoration of His sacrifice and to also distinguish Him from Adam. I have no proof but I get the sense from the Bible the body Jesus walked the earth in is a clone of the body He created for Adam. Of course, the big question is what does the Bible mean by flesh and blood cannot inherit the Kingdom of Heaven. Does this mean our glorified bodies don’t have flesh and blood or is this just another way to say mortal bodies? Will we still have to breathe air, drink, eat, sleep, get a hair cut, shave, go to the bathroom, etc….? 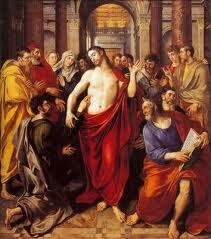 Is the post-resurrection body of Messiah the same as the post-ascension body of Messiah? It would seem to me that the answer is no. When John saw Christ in Revelation, Jesus had a transfigured appearance. The glorification of Christ didn’t happen until after He went into heaven and sat down at the right hand of God. This would indicate to me that our glorified bodies will be different than a merely resurrected body. Paul makes a good case for this in 1 Corinthians 15. I address the question of what “flesh and blood cannot inherit the kingdom of God” means at http://www.onenesspentecostal.com/fleshblood.htm. In short, I think Paul was simply referring to “normal bodies” that have not been glorified. He did not mean that our glorified bodies would not be physical. In 1 Cor 15 Paul makes no distinction between resurrected and glorified bodies. They are one and the same. As for what John saw in Revelation, you have to remember that he is seeing visions. He also sees Jesus as a lamb, but no one thinks this represents how Jesus actually looks. Revelation is apocalyptic literature and uses vivid imagery that does not correspond to reality. Thomas Jefferson’s Presidency of the United States was from March 4, 1801 to March 4, 1809. As the principal author of the United States Declaration of Independence, Jefferson articulated a statement about human rights that most Americans regard as nearly sacred. A merely raised from the dead body will die again, a la Lazarus or any of the other resuscitated people in the Bible. The body in which Christ was raised was the same one in which He died. That body was corruptible (i.e. capable of dying and decaying). He was raised from the dead, and spent the next 40 days on earth, then ascended, at which point, He was transfigured and claimed true incorruption, i.e. a body that cannot die or decay. The resurrected body of Messiah was still the natural body He was born with and died in. It still bore the wounds of the crucifixion. Though it appeared He could do miraculous things (like ascend to Heaven) this doesn’t make it a “spiritual body”. Jesus could do miraculous, physics defying miracles prior to His death, burial, and resurrection (e.g. walk on water). The body Christ had upon immediate resurrection was “of the earth, earthy”, just as Adam was. But now Christ bears a “heavenly body”, whose image we shall come to bear, not merely by being raised from the dead (as some people in this world have experienced) but by being “changed…in the twinkling of an eye…” (vs. 51-52). The ones who are alive and remain at this event will not inhabit standard, natural, earthy bodies. Glorification will come upon them, a change will occur, and we will be like Christ currently is in heaven. Visions can be merely symbolic, not to be taken literally, but what one “sees” then describes, though a vision, can nevertheless be how things literally are. Consider the Lord seeing Nathaniel under the tree. So when John first saw Christ as He approached from behind, I don’t think we have to assume that the white raiment, the golden girdle, the hair like snow, and etc. are merely metaphorical visualizations meant to communicate a symbolic truth about Christ. John saw the man Christ Jesus in His fully glorified state, even though it was in a vision. The rest of the visions (e.g. the lamb) are of course metaphorical, since though called the Lamb of God, Jesus was anything but a quadrupedal mammal covered in wool, not to mention, the seven eyes, seven horns, and etc. Paul was no more an authority about resurrection, spirit, ghost or body than anyone else. Paul only expressed his belief that was without knowledge. What did Jesus say about these things? Everyone slices and dices words thinking they understand but really? Do they? I have always been curious why John would have said that he “did not know Jesus” when John and Jesus were in fact, relatives, cousins. Which is why I said that we slice and dice and parse the words and yet cannot understand the simple things like John saying he didn’t know his cousin? It seems to me, that, ought not be in the bible without explanation. What’s so odd about John not knowing Jesus. They lived in different parts of the country and their paths hadn’t crossed until that day many years later. Well, what’s odd about it is that they were cousins. So to say that one did not know one’s cousin is a stretch of the imagination. In fact their paths crossed easily when Mary vistied Elizabeth when Elizabeth was pregnant with John and stayed with her for three months. Mary and Elizabeth’s paths crossed but Jesus and John never met until Jesus went to the desert where John was baptizing. I don’t see how you can draw the conclusion that John and Jesus did not know each other or met at anytime just from that verse; there’s an entire life of years in there about 30 years to be more exact. I submit that Mary was with Elizabeth for the three months; or, until Elizabeth was delivered her son. And do you really think that for the next 30 years their “paths” never crossed again? I hardly think so I’m afraid. The Bible never says anything changed with Jesus’ body at the ascension. But we do see changes in Jesus’ body after his resurrection (such as being able to appear in a locked room without entering through a door), which make it clear that it was not a mere resuscitation like Lazarus had. Concerning Revelation, it does no good to compare the apocalyptic imagery in Revelation to Jesus seeing Nathaniel under a tree. That’s not apocalyptic literature. And it’s special pleading for your case to pick out one image in Revelation as being literal, but the others as metaphorical. Revelation is filled with imagery that should not be taken as literal. The imagery conveys literal truths about the object in question, but if you looked at the object it would not appear as it does in the imagery. Commentators Albert Barnes and Adam Clarke reached the same conclusion I did. Anyway we’ve gotten off the original topic initiated by Jason Dulle. Thanks for your thoughts. I read your link re: flesh and blood cannot inherit the kingdom of God. Long story short, it wasn’t until I was challenged on what exactly happened after death that I looked into that verse. When I did look into that verse, I was confused by the accounts of Jesus seeming to appear out of nowhere in locked rooms but still having substance that can be touched and able to eat/drink. Since I didn’t find what I thought was a lot of information about glorified bodies in the Bible I looked at other Biblical instances. Some angels like those that took Lot out of Sodom and Gomorrah appear to be beings of substance but most fallen angels or demons appear to be spiritual beings. I believe a glorified body can inherit the kingdom of God but not really sure what a glorified body means when taking into account the Bible appears to be talking about spiritual beings also. I might’ve misunderstood something about what I believe is a spiritual being though. There was no resurrection of Jesus from the dead; it was from the near-dead. There was no ascension of Jesus after the event of Crucifixion. Hence it is most correct to state that Jesus’ body was the same after when he was delivered from the Cross and after when he was seen by the people when he came out of the tomb he was laid. Resurrection from the physical and literal dead and ascension of Jesus to skies is a made-up story by Paul, scribes and Bible. It has got nothing to do with Jesus and his teachings. To add to the idea that Jesus’ resurrected body might be different from his glorified body…he didn’t want Mary to touch him because he had not “ascended to his Father”. That is suggestive of a difference. If you think about the wounds he suffered and the short time since it happened, this suggest that the his body was still in the healing process and one does not manhandle a healing body while it is still freshly wounded but gentle. “Not yet ascended to the Ftaher” may be more an idiom expression than some supernatural reference I submit. Jesus was not transformed with an eternal body and from his own mouth he tells you why. He asked, “Do you have any food here?” They gave him a piece of leftover fish they had cooked. He took it and ate it right before their eyes. **40 And when he had thus spoken, he shewed them his hands and his feet. This is suggestive of “no change” but a more thorough healing as time had passed since he was retrieved from the tomb. Congratualtions on your “branching out” in search of truth. The wounds tell us that if you have loving tender care, you can survive the trauma of beatings, stabbing and deprivation of nutrients and water. Love and medical intervention can interrupt that which otherwise would see death overwhelm the physical body. This is the lesson we learn from the trauma Jesus suffered for stepping on unyielding clerical religious toes.